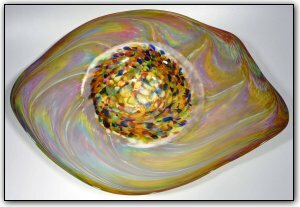 This uniquely shaped wallbowl was created with a process called "incalmo". Each of the sections was made separately, and then they were joined together - one at a time. After all the sections are joined, then the wallbowl is finally made. The outer section features a colorful pastel-like swirl, followed by a band of clear, and finally and the center is a lovely End Of Day® color mix, meaning it is made with a variety of colors used throughout the day and contains nearly every color in the rainbow.